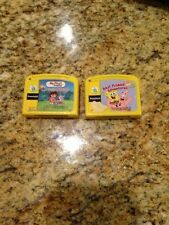 SpongeBob sticker starting to peel scuff on the back of Dora shown in pictures. Dora The Explorer Dora's Amazing SHow. Pre-K - 1st Grade Ages 4-7. DORA the Explorer. 1-2-3 DORA. Age 2-4 yrs. I only list the best of my boy's wardrobe. and to give you the best possible service! Our policy is to make. Great item in great shape. I always use actual photos so what you see is what you get. Check out the pics to know just what you will be receiving. Look at the photos. Dora the Explorer Discovering Words & Language. May shows signs of wear. IF I WERE. We are human, and we do make mistakes and will do whatever possible t o correct them for you. We will help you in any way possible. not as described – not if you do not like the item. THE BOX ISSLIGHTLY TORN BUT IT WAS NEVER USED. 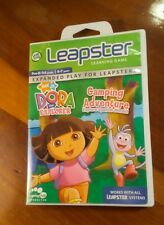 Leapfrog TAG JUNIOR, Dora The Explorer, 123 Dora, 2009. Condition is Used. Shipped with USPS Media Mail. 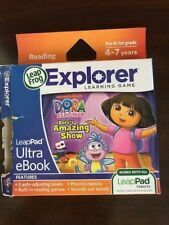 LeapFrog My First LeapPad Dora the Explorer To the Rescue - Complete w/ Book. Condition is Used. Shipped with USPS Priority Mail. Teaches Shapes and counting & Pattern recognition. LeapFrog LeapReader Jr. Interactive Book. Lot of 4 Leap Reader books (pre-owned) Books are in good shape with signs of wear. Fully functional with Leap Reader Junior wand. (wand not included ) For ages 1-8. Condition: Pre-Owned, Good condition Tested and Works.